A peculiar behavioral habit: "his annoying quirks". A strange chance occurrence: "a strange quirk of fate". That is what quirk is. In simple words, it is not just a habit. It is a weird habit that one have. 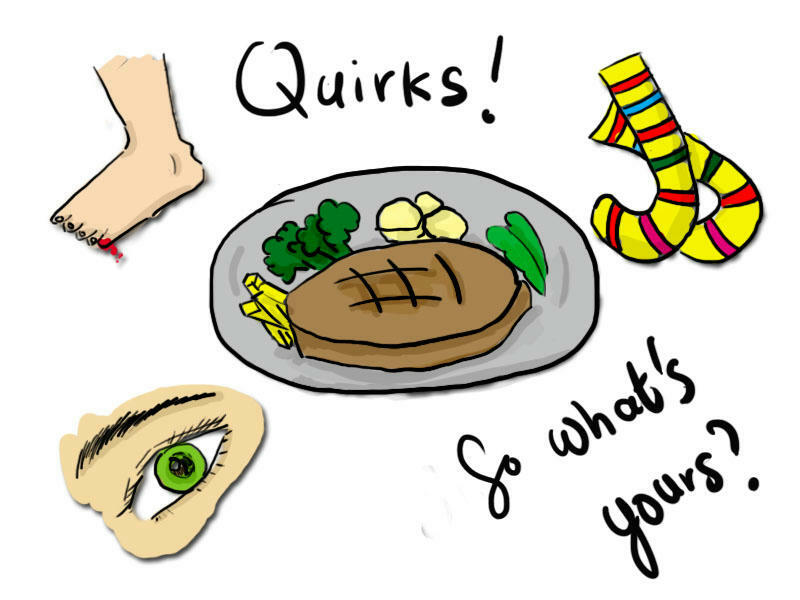 I was just thinking about it this morning and within 15 minutes, I could name a number of quirks that I have. I was surprised to be honest, to realize that I actually have quirks. To think I was normal. Pft. First of all, I dislike socks. For all of you who comes from a 4 season country you must think I am mad but from where I come from, it is actually pretty normal to NOT wear socks, especially for females. I am fine with stockings, I just don't like socks. We don't have winter so most of the time you will catch me with flip flop, sandals, open toes or any other footwear but shoes. I don't do any form of exercise except one where it requires me to move my lower jaw and upper jaw. An exercise also known as chewing. And swallowing. That's the closest to any form of exercise that I would do, so there's perfectly no reason for me to wear any form of closed toe shoes. Reason: I always have trouble with washing socks because I refuse to wash them with any of my other clothing. I find it disgusting but I will not stand to actually collect an entire basket of socks before I can wash it, so that's the reason why I hate socks. I don't know how should I wash them. Second, I used to peel my toe nail when I am under stress. During assignment days or exam days, I will automatically start peeling my toe nail every time I sit down and have my books opened in front of me. Of course I know that's even more disgusting that washing socks but it's a quirk, and I can't help it. Until I tore half of my little toe nail once. That's a very good lesson to make me stop and I haven't touched any toe nail ever since except for pedicure purposes. Third, I am a very needy person. With my blanket. Be the weather hot or cold, I MUST have my blanket covered up till my neck before I can actually sleep. Even if I am taking a nap at 2 in the afternoon at a 33°C weather where it makes my sleep so uncomfortably sweaty and sticky. I can't help it, it's a quirk. Fourth, (which I personally think a lot of you have this as well >D), no nail no finger no toe OUTSIDE of the bed frame. Each inch of my body must be within the bed's perimeter at ALL times. Yes I know there's no Boogie man or even if there is one, my bed's frame is made of solid wood so I don't think Boogie man can hide underneath it BUT still, I can never, ever sleep safely if any part of my body is over the perimeter of the bed. It's just, wrong. "Mish, put your darn finger back into the blanket, RIGHT NOW!" is what my brain would alert me when I put a nail out of the line. Fifth, I always save the best for the last (in food). I've gotten this numerous time. "Why don't you start with the main course instead of the side dishes?" "Wouldn't the nicest part of your food gets cold and then it won't be nice anymore?" "Aren't you afraid of anyone eating your favourite food because they though you cannot finish it?" I just can't. I simply have to finish my least favourite portion of the meal before I start on my favourite food because it's just so satisfying to eat the best pieces at the very last few mouthful. It's a feeling of satisfaction. No. They will have to get past me first before they can touch my food. She has this quirk of staring at people when she's eating. These are just few example of quirks that I have. I have read somewhere that for some people when they lie, you can tell immediately (but only if you are close to the person to begin with) because they will exhibit certain tell-tale signs such as rubbing their nose or ruffling through their hair, things like that. I kinda dislike socks too, but I run a lot so I must wear them or else I get stinky feet!! However, when i wear boots, I usually don't wear socks with them! haha I am a needy person too with one of my stuffed animals! I got her when I was super young and she is always on my bed even when I'm sleeping lol. I know how you feel about your blanket!! Hahaha I love my blanket but I have another weird quirk which I didn't mention above. I dislike plushies ._. I don't know why, lol. BAN BAN BAN plushies! haha I definitely have the 4th one as well! Hilarious post - I love get-to-know-you posts! NO LIMBS OUT OF BED, NOOOOOOOOOOOOOOO! haha!!! quirks!! what a wonderful title of the post!! i also save the best for the last, but my mum keep saying, what if somebody saw the best in your plate and took it away, you probably didn't have any chance to eat it. awwh thanks for your lovely comment in my blog! Hahaha I didn't know about the socks one XD You never told me. I thought you just loved wearing sandals/slippers due to it being a girl thing. As for a quirk of mine, hmmm I think you know most of them eh? Though the worst one is that I can never leave a hangnail alone and have to constantly peel them off until I bled. And it doesn't help that my fingers are really dry due to constant washing from handling animals, so hangnails are on each and every one of my fingers. I peel them so badly that sometimes I bleed on my keyboards and I don't even know it :P But then again, maybe this isn't a quirk, but just a bad habit? Me too, I always save the best for the last! Hahaha! Glad to share something in common. Hahaha I find lots in common . I hate socks , they make me feel uncomfortable . I live in a warm climate area so it is always hard for me to wear them . So you are very versatile, that's awesome! Wow I read all your post and I found it quite humorous. That of leaving the best for last sometimes I do too but not always. I really laughed much fun reading your post. And NOTHING can't be hanging off the bed, stuff might come out from under the bed, dooh!! Lol you are NOT weird, you are AWESOME! I send your link to one of my friend, he's like "I AM GONNA READ THE ENTIRE ARCHIVE" muaheahueaheaeuhaehuaheuae, not kidding! awww this is such a cute and funny post!!!! I feel like I know a lot about you just from reading this lol! Lol my drawing is NOTHING compared to yours but thank you!! <3 Yeah, write down all your little quirks and you will start to think "goodness I have so many! @@"
i love these pics my dear!! I have so many...don't know where to start! I finally have the time to respond to your comment on my recent situation. First of all thank you so much for the kind words - yes it was exactly what you said, it's this "uncalling attention", that's the right expression, I just didn't know how to put it! So good to know that some people can relate to this feeling and so good to hear that it will pass someday. Concerning your post I enjoyed reading it, your style in writing makes me smile :) I can totally relate to the blanket quirk!! It's so annoying in summer but the blanket HAS to cover everything apart from the head. Thanks for your sweety comment!! Oh wow o.o I never had that but that sure is a very interesting quirk! Cute post girl! Hope you're having a great Monday!! Thanks Steven, checking you out! Thanks love, I will definitely check it out!